Every company or industrial enterprise uses a large number of different IT assets (computers, laptops, tablets, telephones, etc.) Obviously, it’s more convenient to store data on the considered office equipment in the special program for PC inventory. When the time comes for inventory, you can easily report to supervising persons. 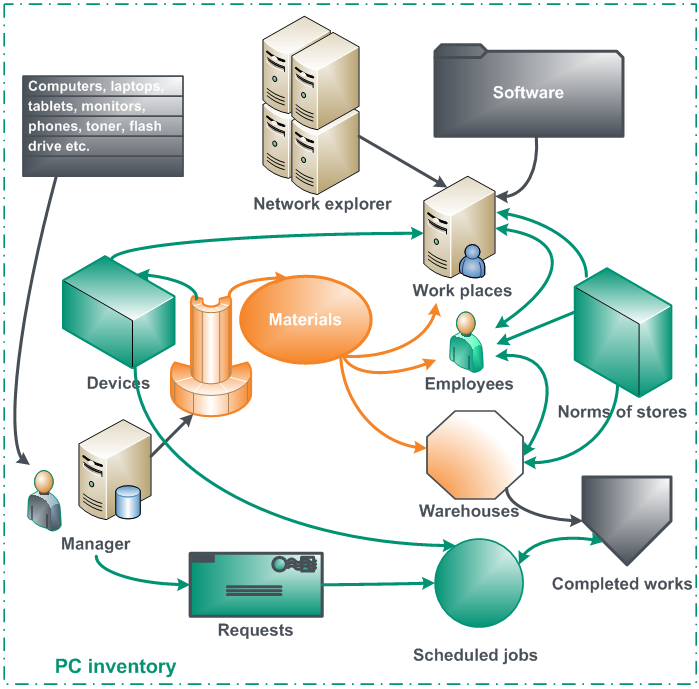 Moreover, PC inventory prevents waste of material values, thereby saving the owner's money. I hope it is clear that if you purchase any IT assets and do not control their movement in any way, then it is not possible to evaluate the effectiveness of their use. Perhaps, you already do not have them, and you forgot about them, because it is impossible to keep everything in your head. Keeping any records in Excel leads to a routine, because it's hard to find the right line in the table every time and correct any of its parameters, for example, where a laptop is currently located. Do you remember your feelings when you last did it? Surely something like, here again I do it, and most likely, that you have postponed it for later several times. This means that your data is no longer relevant. Don't you want to feel good about doing this job? Thus, if you do not want to complicate your life and want everything to be OK, nice and in order, use a specialized program for PC inventory. We are offering you several programs to solve this problem. Each program has its own feature, which allows satisfying the wishes of even the most demanding customers. Let's now talk about how we suggest you consider PC inventorization. First of all, instead of word IT asset in the program the concept of the device is used. This is such a relative concept, behind which there can be any kind of IT asset. To specify type of device is the special reference list of models of devices. The device is something expensive, something that is better taken into account personally, by the piece. Also in the program PC inventory, accounting of small material assets is additionally integrated, for example, office paper, toner for printers, flash drives, etc. It is clear that no one takes into account the sheets of paper by a piece, you can take into account the packs, so this category of IT values is called the material and is taken into account in parties, within a party consumption in pieces, kilograms, etc. (units are defined in the list of units). The division into devices and materials is performed at discretion of a user of the program Inventory of PC. Organizational structure of each company is represented by workplaces, employees, warehouses. These are the places where devices and materials can be located. They can also be in a certain subdivision or department. Envision, an imaginary situation, when, for example, you need control over the availability of certain inventoried PC (accounted IT asset) in a warehouse. These can be laptops for business trip, printer cartridges or hard drives for backup. How would you do this manually? Periodically, several times a week, the balances in a warehouse would be recalculated and the rest of an Excel table corrected? Pretty boring, isn't it? Only our PC inventory program allows you to monitor the norms of stocks at warehouses, employees and workplaces automatically. Each time you start the program in the morning you will receive an appropriate warning if a stock of an IT asset has fallen to a critical level. Let us have a brief outline of what we have discussed above, and then we will discuss additional aspects. And what about purchasing IT assets? Apparently, head of a division agreed with CIO on a purchase of equipment for needs of some department and money was allocated for these purposes. And how do you keep information about this event? Or are you not interested in what specific office equipment was bought on? In our program PC inventory is additionally implemented requests management, these are records in which you can mark on the basis of what was purchased equipment, as well as to each request can be attached a list of purchased IT asset and materials. In requests, you can also mark all users’ problems. This allows you to organize Service Desk in its simplest form. Each request can be specified by its customer, type of request is specified in the list types of requests. Additionally there is a sign of request execution. Also search of certain requests on a filter is realized. Since we are going to inventory PC, and this, first of all laptops, tablets, computers, it would be nice to have information about the installed software on these devices. The software can be not free, the number of licenses is probably limited. With this goal, the system implemented inventory software and licenses. Thus, if you want to inventory your software, you do not need to additionally search for any other program. What if we want PC inventory to be taken into account by itself, as if by magic, because you do not want to enter something there in some program of accounting office equipment? It's impossible! You will say. This is possible, we will answer, however, only in our programs! A separate module allows you to get the list of IT asset in your network, and then automatically import the information received into the database of PC inventory. This process can run in parallel in the background thread according to a specified schedule. And what if some unscrupulous employee unscrewed something from a computer of the company and carried it home? Or, for example, replaced some components. Do you analyze these events in your company? After all, they are causing you material damage. Do not worry, our program will provide you with a detailed log of configuration changes for all office equipment in your computer network. In addition, this log can contain data about installed or uninstalled programs on users' devices.